If you've suddenly noticed your smile looking more “toothy,” you may have a problem with your gums. They may have lost their normal attachment to your tooth and begun to shrink back — or recede. Millions of people have some form of gum recession. The most common cause is periodontal (gum) disease, but it's not the only one. You may be more susceptible to gum recession because of heredity — you have thin gum tissues passed down to you from your parents. You may also be brushing too hard and too often and have damaged your gums. Healthy gums play an important role in dental health. The crown, the tooth's visible part, is covered with a hard, protective shell called enamel. As the enamel ends near where the root begins, the gums take over, forming a tight band around the tooth to protect the roots from bacteria and acid. Receding gums expose these areas of the tooth meant to be covered. This can lead to another tell-tale sign — tooth sensitivity. You begin to notice pain and discomfort while you consume hot or cold foods. And because it leaves your teeth and gums looking much less attractive, it can affect your confidence to smile. Fortunately, though, we can help restore receded gums. If you have gum disease, it's imperative we treat it as early as possible. We do this by removing plaque, a thin film of bacteria and food particles that triggers the infection. We use special techniques and hand instruments to remove plaque and calculus (hardened plaque deposits) from all tooth surfaces including along the roots. 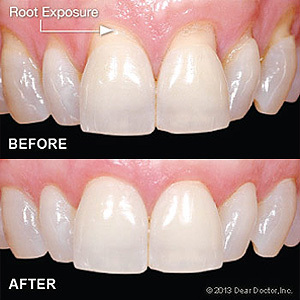 Gum disease treatment can help stop and even reverse gum recession. In some cases, though, the recession may have advanced too far. If so, we may need to consider surgically grafting donor tissue to the recessed areas. Depending on the site and extent of recession, this can be a very involved procedure requiring microscopic techniques. The best approach, though, is to take care of your gums now. Daily brushing and flossing removes harmful plaque; regular dental visits take cleaning a step further and also give us an opportunity to detect disease early. By looking out for your gums now you might be able to avoid gum recession in the future. If you would like more information on diagnosing and treating gum recession, please contact us or schedule an appointment for a consultation.